Photo courtesy of Katherine Rust. 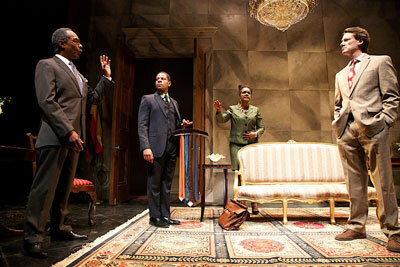 Michael Rogers as Mugabe, Che Ayende as Gabriel, Rosalyn Coleman as Grace, Ezra Barnes as Andrew Peric. I am concerned with what goes on inside the mind. As my record shows, my own skin color, the color of my patient’s skin, I don’t consider that relevant. FRASER GRACE (playwright) Before becoming a playwright, Fraser Grace worked as an actor and performance poet. 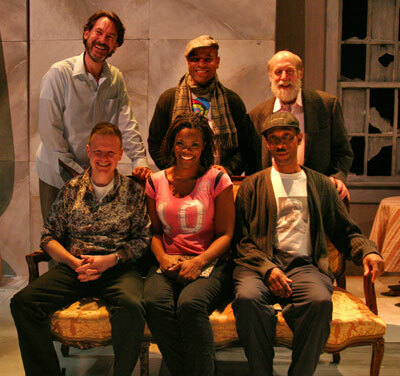 His first play, Perpetua, was joint winner of the Verity Bargate Award and was produced by Soho Theatre/Birmingham REP. 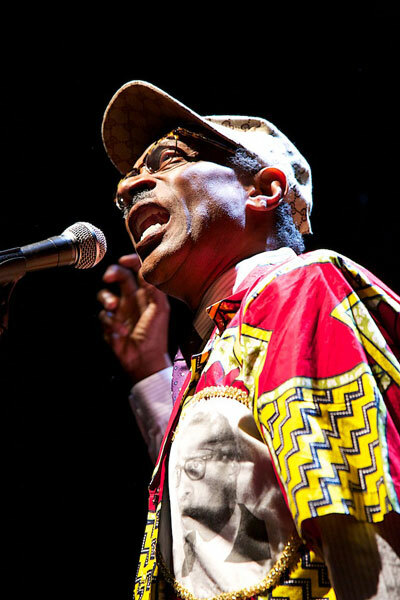 Since then, he has written for theatres all over the UK, including the Royal Shakespeare Company, whose production of Breakfast with Mugabe won the John Whiting Award in 2006 and a Silver Sony Award when broadcast on BBC Radio 3 and the World Service. The play has since been revived in the UK and the US. More recent plays include The Lifesavers (Theatre 503/Mercury Theatre Colchester), shortlisted for TMA Best Play 2009, and King David: Man of Blood (Mercury Theatre, Colchester, 2010). A new play, Kalashnikov, In The Woods By The Lake, will tour the UK in Autumn 2011. His plays are published by Oberon books. 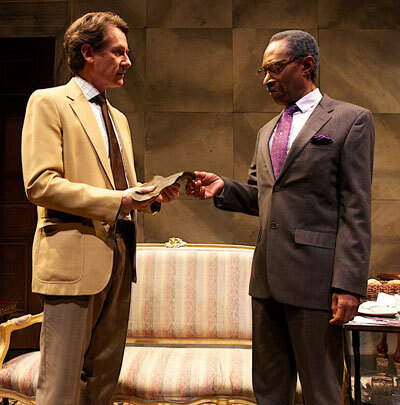 DAVID SHOOKHOFF (director)worked with this same wonderful company on Breakfast with Mugabe at The Signature Theatre Center this past fall as well as at Centenary Stage two seasons ago. He has directed numerous plays and operas in New York City and regionally; companies include Ensemble Studio Theatre, Yale Repertory Theatre, The Juilliard School, and Manhattan Theatre Club. He has taught and directed at colleges and universities throughout the region. As Education Director of Manhattan Theatre Club, he has designed programs that annually serve 3,000 individuals in New York City and around the world. He holds an MFA in directing from the Yale School of Drama. TWO PLANKS PRODUCTIONS (producer) There is an old saying that that’s all you need to make theater: two planks and a passion. While that doesn’t really hold true in the modern world, the spirit still exists. Two Planks and a Passion is devoted to bringing compelling theater to an engaged audience. Breakfast With Mugabe is its first production and its founder is Ezra Barnes. HARRISON HARVEY (general manager) has worked with many of New York City’s defining, award-winning theater producing companies including The New Group, Classic Stage Company, N.Y.M.F., The Keen Company, The Actor’s Company Theatre and many more. Harrison previously served as General Manager of The Ride, a unique bus touring N.Y.C., as the Executive Director for The Clockwork Theatre, and as the Box Office Treasurer for Theatre Row for over 500 productions. Harrison is also currently a part of the General Management team for the Off-Broadway hits Sistas and F#%king Up Everything. LEE SAVAGE (scenic designer) New York City designs include: Primary Stages, Rx; LCT3, All-American; LABrynth, Thinner Than Water; Roundabout Underground, The Dream of the Burning Boy, and Ordinary Days; Page 73, Jack's Precious Moment; Atlantic Theater, Oohrah! ; Partial Comfort, The Bereaved; NAATCO, The Seagull; Clubbed Thumb, punkplay; EST, End Days; the International Fringe Festival, Go-Go Kitty Go!, Fringe New York City Best Play Award; Prospect Theater Company, West Moon Street; Committee Theater Company, The Private Lives of Eskimos and I Heart Kant; La Mama, Harvest; HERE, Frag; and Urban Stages, Worth. 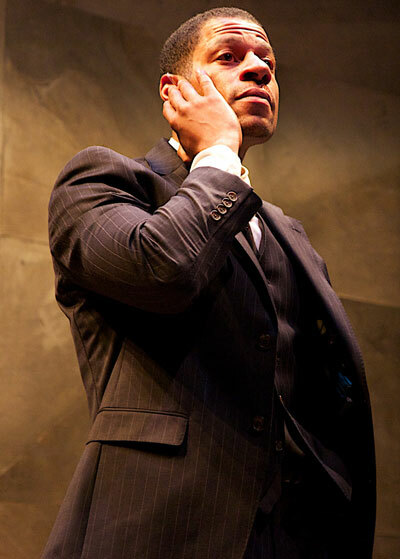 Regional credits include productions at: The Alliance; Asolo Rep; Baltimore Centerstage; Berkshire Theatre Festival; Chautauqua; Dallas Theater Center; Delaware Theatre Company; Glimmerglass Festival; Goodman; Guthrie; Long Wharf; Lyric Theatre of Oklahoma; Old Globe; Shakespeare Theatre Company; Signature; Philadelphia Theatre Company; Trinity Rep; Two River Theater, Wilma and Yale Rep. Mr. Savage is the recipient of the Connecticut Critics Circle Award (The Intelligent Design of Jenny Chow) and Helen Hayes Award (Much Ado About Nothing, Richard III (nom)). Upcoming projects include: Nerds (North Carolina Theatre), Teddy Ferrara (Goodman Theatre), and Collapse(Women's Project). Mr. Savage holds a Master of Fine Arts, Yale School of Drama; a Bachelor of Fine Arts, Rhode Island School of Design; is a founding member of Wingspace Theatrical Design and currently serves on the faculty of Yale School of Drama. TERESA SNIDER-STEIN (costume designer) I’m Not Rappaport (Broadway & Regional Tour); the Pulitzer Prize-winning The Young Man from Atlanta (Signature Theatre, Huntington Theatre, Alley Theatre). Most recent Off-Boadway credits include Him (Primary Stages), Bill W and Dr. Bob (Soho Playhouse). Selected NY credits: Lincoln Center, Playwrights Horizons, NY Public Theater, Lucille Lortel, Classic Stage Co., Vineyard Theater Co. and resident costume designer for 35 productions at Signature Theatre. Regional: South Coast Rep, Goodspeed Opera Company, New York Stage and Film, Dallas Theatre Center, Williamstown Theatre Festival, Ford’s Theater, Coconut Grove Playhouse, George Street Playhouse, Portland Stage Company, Dorset Theatre Festival and Paper Mill Playhouse. Bronze Medal Costume Design 2005, World Stage Design International Exhibition. JOYCE LIAO (lighting designer) is an award winning lighting designer based in New York. 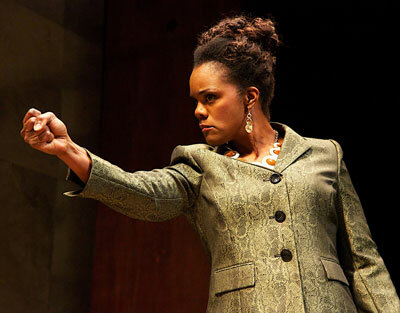 Her lighting design helped Soul of Shaolin to nominations for a Tony Award for Best Special Theatrical Event, and a Drama Desk Award for Unique Theatrical Experience. Her recent and up coming projects include: Collections de Ballet, Taipei City Stage; The English Bride, Centenary Stage Theater and Theater 59E59, Fall 2013; Years of Sky, Theater 59E59, The Immigrant and Say Goodnight, Gracie!, Seven Angels Theater; A Chance Shadow, Dixon Place; Anthony and Cleopatra, Take Wing and Sour Theater; The Heretic, Burning Coal Theatre, amoung others. Joyce's lighting work has also been seen nationally in theaters in New Orleans, Seattle and Washington, D.C., as well as, internationally in Taipei, Shanghai and Bucharest. For more information please visit joyceliaodesign.com. COLIN WHITELY (sound designer)is a sound designer based out of New York City. His credits include Dreamgirls (Main State Music Theater), Les Miserables (Main State Music Theater), Mouse Trap (Centenary Stage Company), Marry Me a Little (Keen Company), 42nd Street (Main State Music Theater), Sunset Boulevard (Main State Music Theater), As Wide As I Can See (HERE Arts Center), Love Song (59E59), Henry VI: Part III (Wide Eyed Productions), Paternity (Cherry Lane Theater), True West (Athena Theater Company) and many more. Colin is very excited to be working on Breakfast with Mugabe a second time! DREW FRANCIS (production manager), Recent projects include: The World Is Round, directed by Rachel Dickstein,BAM, Our Planet, directed by Alec Duffy, Japan Society, Ballerina Swan, Mint Theatre. Current: Production Manager for Making Books Sing, NYC and Queens Symphony Orchestra, Queens. Technical Director Girl Without Wings, Phoenix Theatre, Business Manager, Shadowland Theatre, Artisan, Tiffany & Co. Recent Scene Design: LABrinyth Theatre, Mint Theatre, Kraine Theatre, Tribeca Performing Arts Center, Neighborhood Playhouse, Colleagues Theatre, Red Circle, Theatre for a New Audience Regional Theatre: Shadowland Theatre, Dreamcather Theatre, New Jersey Rep, Playwrights Theatre of New Jersey, InterAct Theatre, Theatre S., Muhlenberg Theatre, Open Door Theatre, La Jolla Playhouse, Missouri Rep., Colorado Shakespeare, Half Moon Theatre, Next Move Theatre, Merrimack Regional Theatre, Touchstone Theatre, Childrens Theatre of Pennsylvania. Designer: New York Toy Fair, Disney, Fisher Price, Mattel, Sesame Street. Currently Adjunct Professor and Scene Designer at SUNY Ulster. DEVIN DAY (assistant stage manager)Broadway: I'll Eat You Last: A Chat with Sue Mengers. Off-Broadway: Pinkolandia, Lucy Loves Me (INTAR), The Men (Primary Stages, workshop), The Fig Leaves Are Falling (UnsungMusicalsCo. Inc.) DC Theatre credits include shows for the Source Festival, Capital Fringe Festival and Taffety Punk Theatre Company. Graduate of the University of Mary Washington. SARAH GOSNELL (associate costume designer) Recent Design: Schoomzy Togetherness, House as Home (Williamstown), Dublin by Lamplight, Status Update (McCarter), The Mushroom Pickers (Alloy Theatre), Mercury (Superhero Clubhouse) Malfi, Inc., Life Among the Natives (Milk Can Theatre), God Steeling (Bridge Theater) and A View from the Bridge (Vertical Player Repertory). Recent Associate/Assistant Design: The Great God Pan (Playwrights Horizons), 4,000 Miles (Lincoln Center), A Public Reading of an Unproduced Screenplay About the Death of Walt Disney (Soho Rep), Emotional Creature (Signature), HIM, Harrison, TX (Primary Stages), Kepler (Spoleto Festival USA), Bill W. and Dr. Bob (Soho Playhouse), Baby Screams Miracle, Phoebe in Winter (Clubbed Thumb), Sleeping Rough (Page 73) and Curse of the Staving Class (Wilma). DREW FRANCIS(production manager)Recent projects include The World Is Round, directed by Rachel Dickstein, BAM; Our Planet, directed by Alec Duffy, Japan Society; Ballerina Swan, Mint Theatre. Current: Production Manager for Making Books Sing, NYC and Queens Symphony Orchestra, Queens. Technical Director for Girl Without Wings, Phoenix Theatre. Business Manager, Shadowland Theatre, Artisan, Tiffany & Co. Recent Scene Design: LABrinyth Theatre, Mint Theatre, Kraine Theatre, Tribeca Performing Arts Center, Neighborhood Playhouse, Colleagues Theatre, Red Circle, Theatre for a New Audience. Regional Theatre: Shadowland Theatre, Dreamcatcher Theatre, New Jersey Rep, Playwrights Theatre of New Jersey, InterAct Theatre, Theatre S., Muhlenberg Theatre, Open Door Theatre, La Jolla Playhouse, Missouri Rep., Colorado Shakespeare, Half Moon Theatre, Next Move Theatre, Merrimack Regional Theatre, Touchstone Theatre, Childrens Theatre of Pennsylvania. Designer: New York Toy Fair, Disney, Fisher Price, Mattel, Sesame Street. Currently Adjunct Professor and Scene Designer at SUNY Ulster. Sam is a communications professional with more than 25 years of experience in entertainment publicity and corporate communications. She is founder of SM Communications (SMC), an independent, full service public relations agency with a focus on corporate branding and entertainment (theatre, film, television, celebrity) publicity. DOUG BARRON (graphics & web design)This is the 24th year designing graphics, typesetting and web sites for many Off- and Off-Off-Broadway theatres and productions, and for numerous artists and performers including Ezra Barnes, whom he first met on a street in Brooklyn in To Kill a Mockingbird. GREGORY COOPER (assistant director) is delighted to be part of the Breakfast with Mugabe family again after having assisted the recent production at Signature Theatre. He has taught English, film, and theatre to middle and high-schoolers; worked for the education departments of Manhattan Theatre Club and The Joyce Theater; and managed the New York City Arts in Education Roundtable. He is currently at work on a documentary about the original production of the Prince-Sondheim musical Follies. PIPER THEATRE PRODUCTIONS (associate producer) In eleven years, Piper has become one of the top emerging theatre companies in New York State. Piper’s mission is devoted to creating free accessible and dynamic theatre for families, creating opportunities for emerging artists,and creating a safe and nurturing theatre experience for children. CENTENARY STAGE COMPANY (associate producer), located on the campus of Centenary College in Northwest New Jersey, is dedicated to making art a part of our daily lives and to presenting theatrical treasures rarely seen on the more commercial stages of New Jersey. Our commitment to the art of theatre is reflected in our selection of material. We do not make safe, generic choices; we produce not only new works each season, but look to re-examine neglected works by bringing these under-performed plays to the public. We do this for many reasons, not the least of which is our belief in the value of the playwright's message for society. We continue in these uncertain times to take artistic risks, and to seek new voices and daring artists. SUSAN JANE WALKER (associate producer), is an actor, stage manager, production and casting assistant. She has acted in touring companies throughout the US and Europe, regional theaters, tv and films and is a founding member of the Pulse Ensemble. For over 20 years she has been an active supporter of The Actors Fund and loan officer, chairmen of the credit committee and board member of the Actors Federal Credit Union. She was Executive Producer of And if Tomorrow, which was shown in several festivals in the US and abroad. She is now working as a mentor and producer with filmmakers associated with the Crossroads Cultural Center. She is pleased to be working with Ezra Barnes again after performing with him years ago.